Toby (or as I call him, Panda) is seen lounging under a peony. This my photography friends was one of my toughest shots. Why? The colors of black and white are the hardest shots to get. Mainly because the auto focus on cameras cannot recognize and process those colors effectively. I mentioned the nuances of white yesterday but now lets look at black. Hover over this pic and you see will the differences. Black is not always black nor is white always white! So how do you get shots like this? Having a Sony a77 and soon to be an a99 for full frame, they have the ‘live view’ option when composing the subject. Yes I WAS a Canon shooter but having switched to Sony endears me with speed and color accuracy. This shot could not be composed as is unless I was in full manual mode. Sideline, if your camera has a ‘P’ for program button on your dial, start using that instead of the prepackaged ‘auto’ and ‘scenery’ settings. Then all you need to do is set your ISO at 100 or 200 for sunny days, 400 for cloudy/shady days and 800 for sunrise/sunset pics. If you know how to get to your white balance ‘WB’ settings, set appropriately for the day/night and get away from using the ‘auto’ white balance. If your camera does have the ‘P’ setting, it will automatically set your ‘F stop’ and ‘S shutter’ speeds. Cool huh? 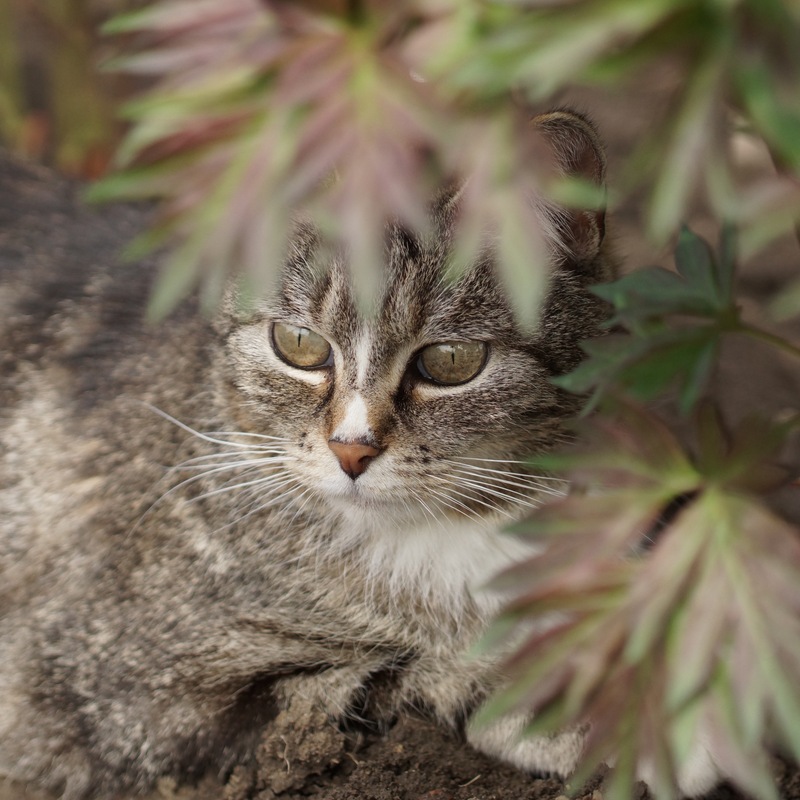 Now back to composing this shot manually…1) ISO 400, 2) F 8.0, 3) S 1/800 4) WB daylight/sun and 5) manual focus (why? if I were to use the auto focus (AF) it can not register black and white. 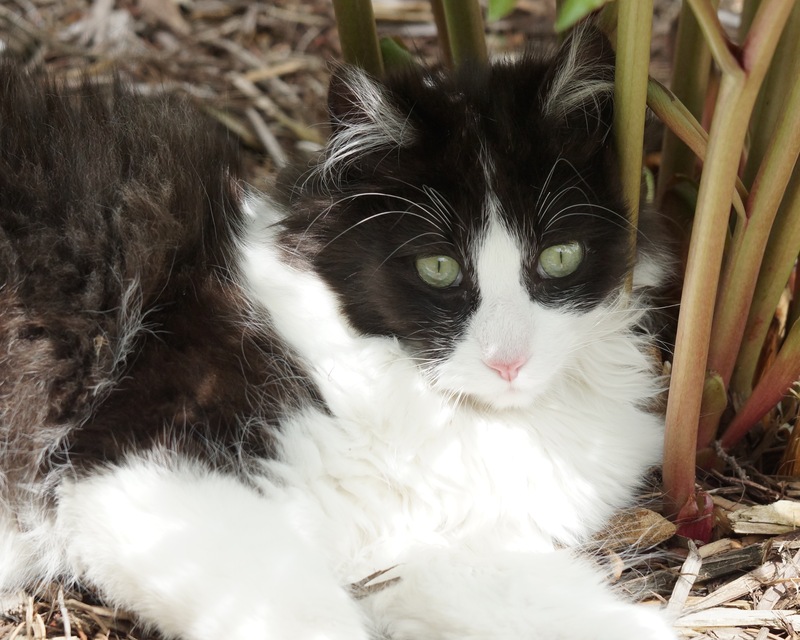 I tried AF by focusing on the peony stem next to Toby’s nose and then moved the camera over to compose the shot, but it still came out blurry. The more you can get away from auto photography, the better your photos will be. Back when Swenson Gardens first started, I use to use a Canon A80 point and shoot camera. Yes 1 out of 10 shots were ok but now in the DSLR world, at least 90% of my shots are good. Yes it takes some practice and both Becky and i went through a digital photography class at National Camera Exchange as well as other classes, BUT time behind the eye piece of your camera is still the best way to learn. Happy shooting! Macro lens are not just for close ups. I’m almost thinking in some subjects that using a macro lens really makes the details pop. Hover over the pics to enlarge and you will see what I mean. This photo was cropped; however, all photos shown on our website, blog and Facebook pages are all shot as is. We DO NOT use any software enhancement programs so you get to see all pics as is. Depending on your computer monitor, tablet and phones, colors may appear different on each device. I switch between a new 27″ iMac and a 32″ 1080p monitor and am amazed at the difference. From time to time I will offer some tips for those of us who like to get up close and personable with our subject matter. Today had perfect light conditions for macro photos. What is the perfect light condition? Cloudy, with some diffused sun penetration. You need some light penetration to allow your subject matter to pop! The dreaded dandelion comes alive with color against its dark green background. Trying out my new Tamron 90mm F/2.8 Di lens on a Sony A77 body. I also use a UV filter made by B&W and model is a XS – Pro Digital MRC nano. Yes its expensive but well worth it! Since I love color, I like to keep my F stop around 7.1 or 8 and adjust shutter speed and ISO from there. 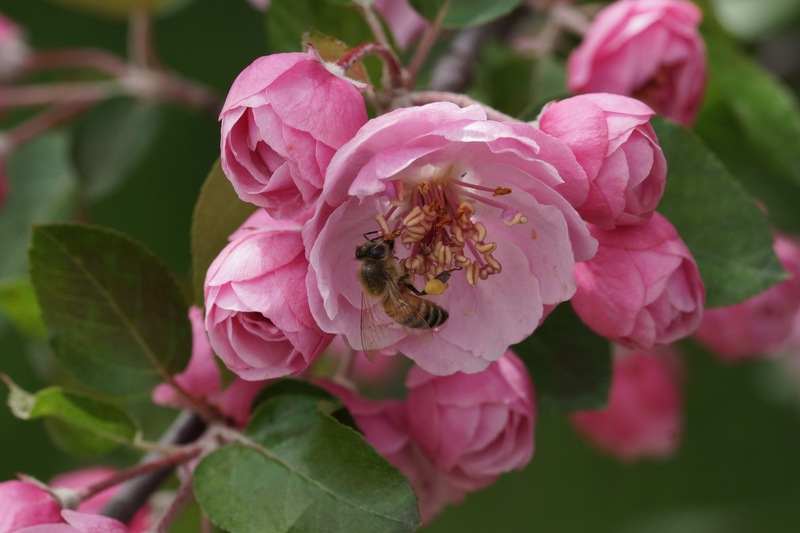 One of our crab apple trees was loaded with honey bees (YES!) and just could not pass this up. 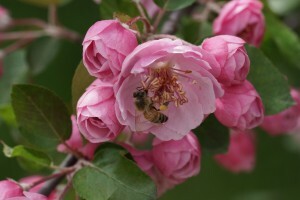 Notice the pollen on this worker honey bee. Because the sun was peaking through the clouds, moved the white balance to ‘daylight’, ISO down to 400 and shutter speed at 1/640. The saturation of the color is amazing. I prefer manual focusing in the macro mode as automatic focus takes too long to get the shot and by that time the shot may be missed. White is one of the toughest colors to shoot. I prefer sunlight in this case to really bring out the nuances and textures as this apple tree bloom presented itself in between the clouds. Again though this is a somewhat diffused sunlight, but what a difference versus shooting white when it was all cloudy. Happy photo hunting! Can’t wait for the peonies to show! 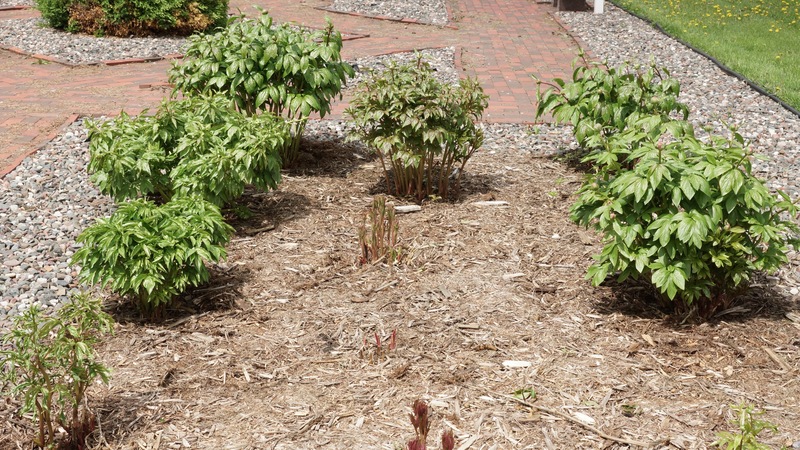 With almost 3″ of rain this past week, peonies in one of our display gardens are looking great. As you can see the larger plants are early blooms, next size down are mid blooms and ones just starting are late blooms. This is why we stress planning your gardens with various bloom time peonies. Our new bloom time page should be updated soon with varieties available this season. 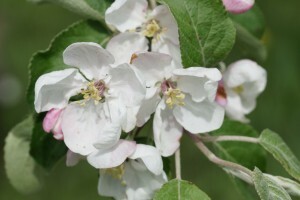 In past years we’ve had at least six weeks of color from the first bloom to the last bloom. 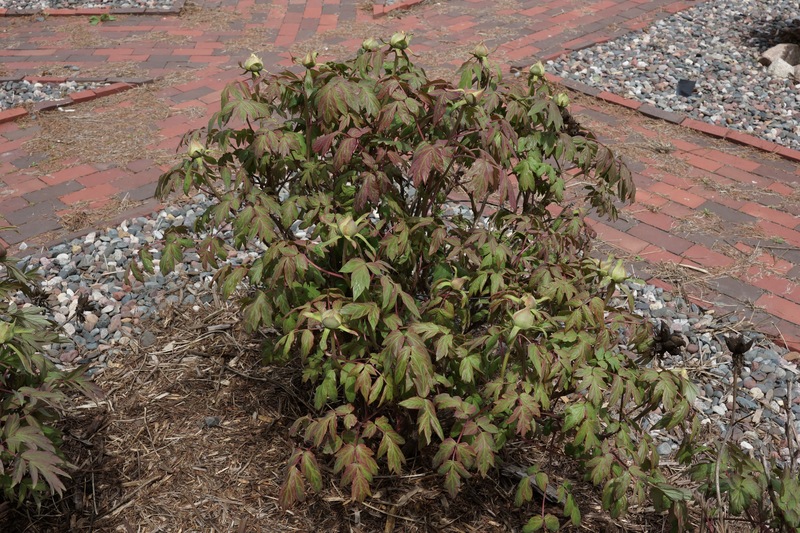 Fun to have ‘peony color’ this long versus having one type of variety that blooms and then you are done. Tree peonies have set their buds and should have color in the next week or so. 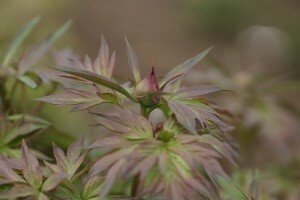 Tree peonies are sometimes one of the first ‘paeon’ to bloom, but this year the hybrid fern leafs beat the tree peonies. We will not have tree peonies for sale this year but maybe in the next year or two. 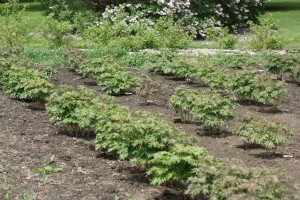 All of our tree peonies are some of Roger Anderson’s seedlings so am anxious to see how they bloom and plant habitat. 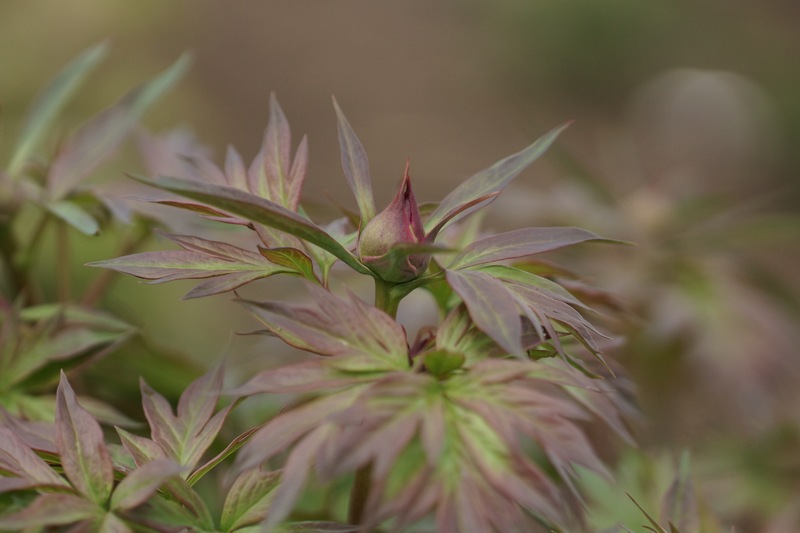 Since we are USDA zone 4a and at the colder range of tree peonies, the only variety that has made it in our fields are Japanese, Lutea and P.rockii’s. 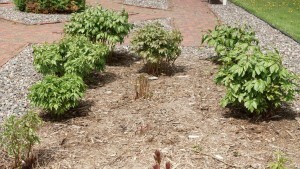 Chinese, American and Daphnes do not make it up here unless winter mulch/cover is provided. Just a word of caution to those of you who may be inspired to buy potted tree peonies and/or box store peonies, unless you know where they were raised and what if any name they are, don’t buy them! You get what you pay for. 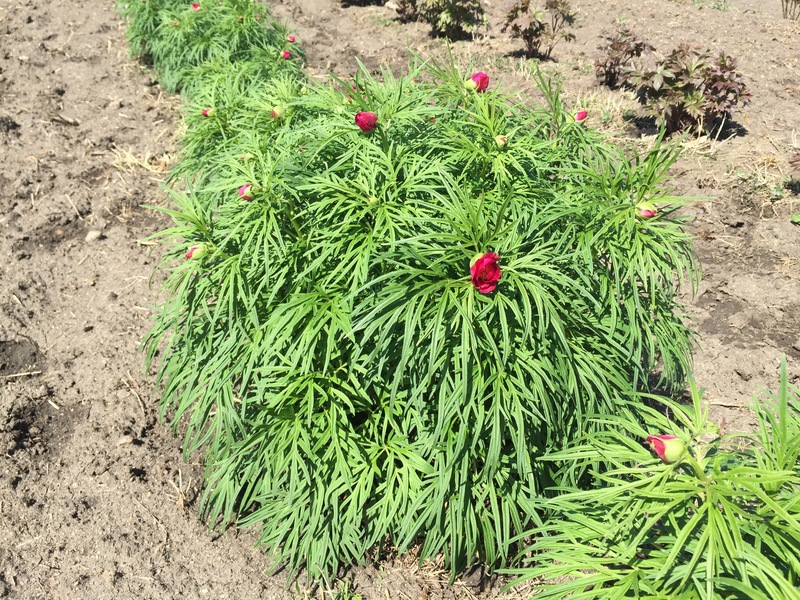 Stay tuned over the next few years as our field grown tree peony stock continues to grow and surprise us! Intersectional hybrid peonies are just starting to set their buds. Can’t wait to see their color! And the winner is Little Red Gem. 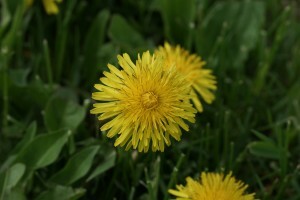 Welcome to Swenson Gardens new Blog! For those of you new to SwensonGardens.com, thanks for stopping by. 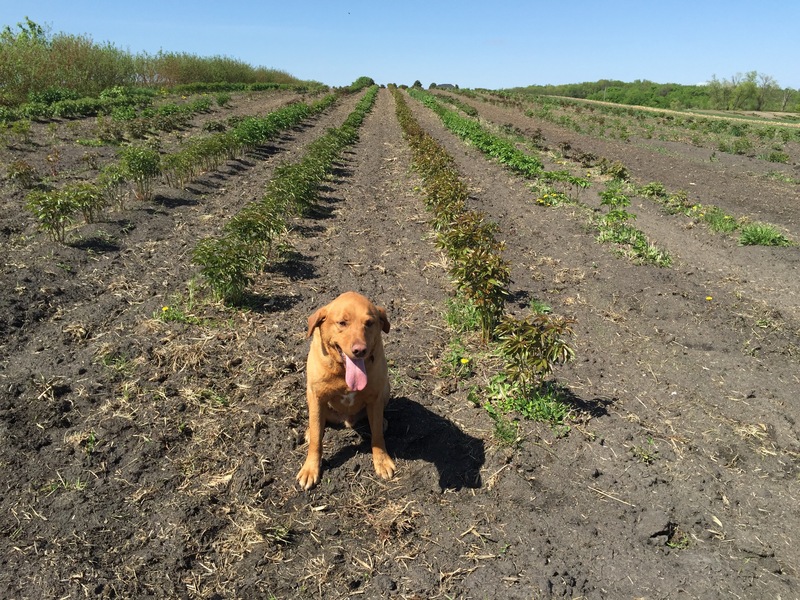 This is Keith Swenson and my side kick, Redd, of course our red lab. Thought it would be easier to remember his name by the color and type of lab he is. Brownie, our chocolate lab, was too shy to be in the picture. With 35 various cows, cats and dogs (all of whom have names), it does get a tad confusing, well a lot confusing for my age. Now peonies, no problem on names. 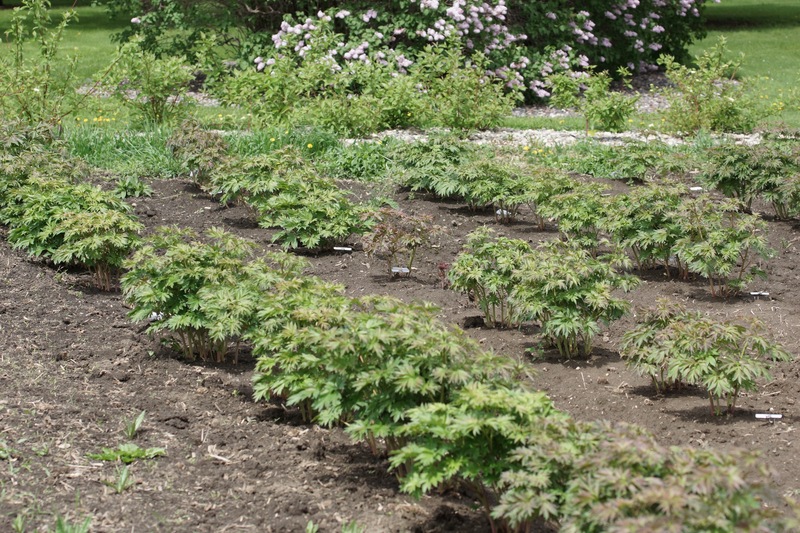 We grow over 300 varieties of named peonies and 1000’s of unnamed Roger Anderson’s seedlings. I hope to bring you a taste of our family and farm life as we begin this new adventure together. 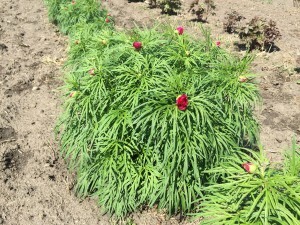 As you can see in the picture, peonies are doing great! Spring is relatively normal for us versus the past two years of a very late spring. 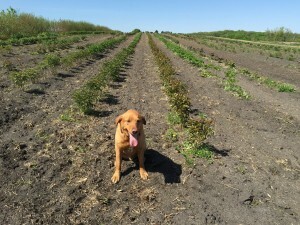 I will be posting the dates for our Peony Field Days when we get closer to peak bloom. Make sure to bookmark this page as our old blog will be going away. Happy gardening!